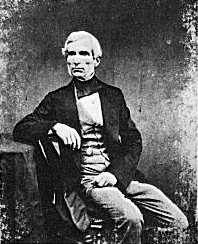 Antoine François Jean Claudet (August 18, 1797 – December 27, 1867), was a French photographer and artist who produced daguerreotypes. Claudet was born in La Croix-Rousse son of Claude Claudet, a cloth merchant and Etiennette Julie Montagnat, was active in Great Britain and died in London. He was a student of photography pioneer Louis Daguerre. Claudet headed a glass factory at Choisy-le-Roi together with Georges Bontemps and moved to England to promote the factory with a shop in High Holborn, London. Having acquired a share in L. J. M. Daguerre's invention, he was one of the first to practice daguerreotype portraiture in England, and he improved the sensitizing process by using chlorine (instead of bromine) in addition to iodine, thus gaining greater rapidity of action. He also invented the red (safe) dark-room light, and it was he who suggested the idea of using a series of photographs to create the illusion of movement. The idea of using painted backdrops is also attributed to him. In 1848 he produced the photographometer, an instrument designed to measure the intensity of photogenic rays; and in 1849 he brought out the focimeter, for securing a perfect focus in photographic portraiture. He was elected a fellow of the Royal Society in 1853, and in 1858 he produced the stereomonoscope, in reply to a challenge from Sir David Brewster. In 1851 he moved his business to 107 Regent Street, where he established what he called a "Temple to Photography." 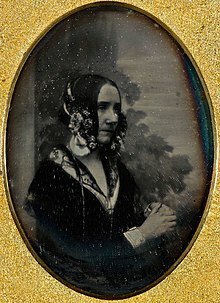 Claudet received many honours, among which was the appointment, in 1853, as "Photographer-in-ordinary" to Queen Victoria, and the award, ten years later, of an honor from Napoleon III of France. He died in London in 1867. Less than a month after his death, his "Temple to photography" was burnt down, and most of his valuable photographs were lost. Wikimedia Commons has media related to Antoine Claudet. ^ a b c One or more of the preceding sentences incorporates text from a publication now in the public domain: Chisholm, Hugh, ed. (1911). "Claudet, Antoine François Jean" . Encyclopædia Britannica. 6 (11th ed.). Cambridge University Press. p. 463. ^ Brothers, A. (1899). Photography: Its History, Processes, Apparatus, and Materials: Comprising Working Details of All the More Important Methods. C. Griffin, limited. p. 225. Retrieved 2017-08-20. This page was last edited on 18 November 2018, at 10:10 (UTC).